Springtime is the season of renewal, so it is appropriate that efforts to pass the San Juan Mountains Wilderness Act are ramping up right now. Introduced in 2009 and last considered by Congress in 2013 – when it passed through the committee process in both the House and Senate with bipartisan support – the bill has since been sidetracked. That is unfortunate, because unlike some public land proposals, this one has a remarkable level of local support. Board of commissioners from Ouray, San Juan and San Miguel Counties support the bill, as do the towns of Norwood, Ophir, Ridgway, Mountain Village and Telluride. It has been endorsed by a wide range of businesses, ranchers, homeowner associations and adjacent landowners, and its proposed boundaries drawn and redrawn to conform to the wishes of guide services, jeepers and snowmobile enthusiasts, so areas popular for motorized recreation remain outside wilderness boundaries. This legislation was created by a painstaking process. Local input was sought, considered and incorporated at every incremental step of the way. 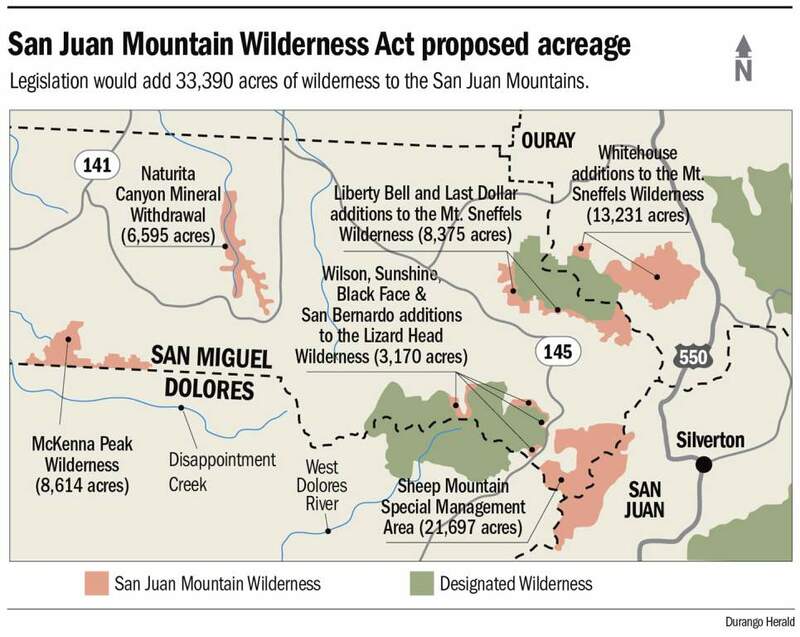 On the map, what is proposed as Colorado’s newest wilderness is a mix of additions to existing wilderness areas (33,390 acres) and several separate designations to place protections on a total of 61,000 acres of pristine, scenic land that deserves to remain undisturbed and visited only on foot or horseback. In Washington, Sen. Michael Bennet, D-Denver, is leading the push to pass the legislation this year, as he did in previous years, and we urge Sen. Cory Gardner, R-Yuma, to provide essential bipartisan support. Rep. Scott Tipton, R-Cortez, appears to be unsold on the bill, and considering the depth of local support his stand is surprising. It is also unwise. Tipton has been under fire, even in his home county, for being lackluster in his support for public lands. His detractors claim he supports the conservative call to transfer federal public lands to local control. Whether that criticism is deserved is open to some debate. But by supporting this act, Tipton could quickly put it to rest.